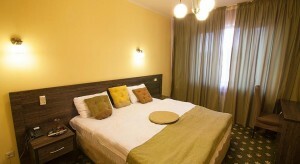 Located in the centre of Almaty, Golden Palace Hotel features free private parking and free Wi-Fi in all areas. Abay Prospekt and Baykonur Metro Station are 0.6 miles away. The bright air-conditioned rooms feature a minibar and a flat-screen TV with cable and satellite channels. The private bathroom is equipped with free toiletries. Guests can order a meal in the restaurant or enjoy their favourite drink at the bar. Almaty Train Station is within a 10-minute drive. Almaty International Airport is 9.9 miles from Golden Palace Hotel.